We’re not talking about flashing lights or fairy lights, here. A cool, grown-up bed has lights in a way that adds style and substance. A Mode Bed, for example, uses LED under-bed lighting. If you need to get up in the middle of the night, but don’t want to jolt yourself (or your partner) into full wakefulness with the lamp, the soft lighting at ground level will safely get you where you need to go. There’s a 30-minute timer, too, so you can get back under the covers without racing back from the bathroom. And you can turn the lights on and off using the Mode App, so you have complete control. The idea of a fully adjustable bed, or a motion base, used to be the stuff of Sci-Fi. Then it became something you’d only see in hospitals. Now, it’s the truly modern way to get a great night’s sleep. Need your head raised a little more to stave off the snoring? How about feet raised to reduce pressure on your joints? You got it. Plus, with a split-base bed, you can adjust your side to your liking, while your partner can choose their own settings. But a futuristic bed needs to be more than adjustable and that’s where an app comes in. Control your bed from your phone, set your favourite mode at the touch of a button, store different configurations depending on your needs… And if your partner is keeping you awake with their snoring, use the app to gently adjust their position to the ‘anti snore’ mode. Now that’s a smart bed. If you can get a massage chair, why not a massage bed? That’s definitely on our list of things that a modern bed should include. Let go of the stresses of the day, while relaxing and reclining. A little bit of heaven in your bedroom. The thing that makes it really smart is the ability to control not only the pulse versus continuous type of massage, but also the intensity. Had a tough session in the gym? Opt for a firm massage. Just want to relax and drift off? A soft and gentle massage is perfect. Plus controlling it all from your phone makes life nice and simple. All that use of your phone to control your bed, you’d think the bed would have USB charging ports included, wouldn’t you? Any smart bed worth looking at certainly will, and the Mode bed is no exception. Integrated dual USB ports are installed on both sides of the bed, so there’s no arguing about who gets to plug in their phone, kindle, sunrise lamp, or anything else. The whole point of a smart bed, or a futuristic bed, is to get technology to integrate with comfort – it wouldn’t matter how clever and high-tech a bed is, if it doesn’t feel comfortable or luxurious. If you’re going to spend all night, every night in a bed, it needs to work with a good mattress too. 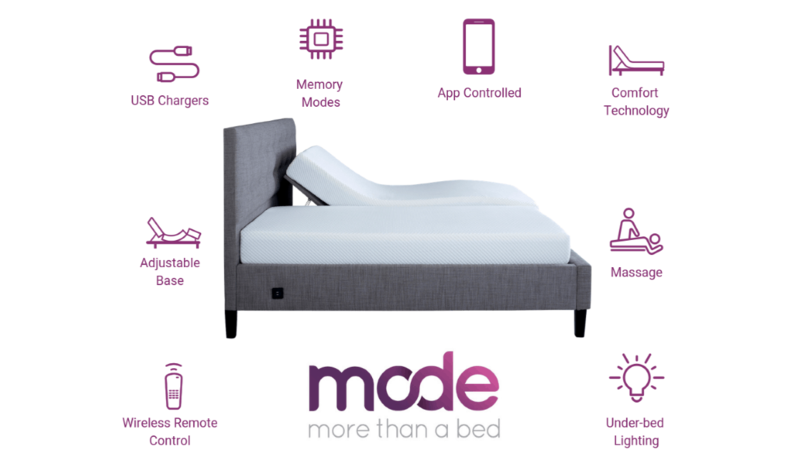 Mode Mattress is cleverly designed to move along with a smart bed, contouring to your body and giving you complete comfort no matter what position you choose. Plus the open-celled memory foam is super breathable, helping to keep you cool and provide the best support for your body.